john4jack (Corvallis, Oregon, United States) on 27 September 2011 in Miscellaneous. NOTE: yesterday's post was offered primarily to demonstrate that a fine photograph in color does not always render well in monochrome. We need to let the photograph itself show us the way to go. One of the pluses of posting every day is that we can experiment, play, push the envelope, run things up the flag pole to see if anyone will salute. Aminus 3 is not only about posting the best of which we are capable. :))) thank you for the description :))) they are still so beautiful!!!!!!!!!!!!!!!!!!!!!! Nicely imitated indeed ! Happy ST ! Gorgeous petals, can imagine the softness and the colour is extremely beautiful. artificial but it makes a good picture !!! strong tones and shadows make it great ! really nice texture.. although it is artificial.. Happy ST! Umm, "Out for a walk", and you come across artificial flowers? I guess the walk isn't in the Rockies!!! Ha! The tones are too perfect! Artificial but beautiful. Have a nice day Jack. Still makes for a good shot! A precious flower that will never wilt...great capture! These days it's difficult to distinguish the real from the artificial. Nice shot of the beautifully color flower-wanna-be petals. I like your thinking. Sometimes I wonder why we are collecting hundreds of images that may or more likely won't be looked at again. Interesante los pétalos. Parecen tener huellas digitales. / Interesting petals. They seem to have fingerprints. 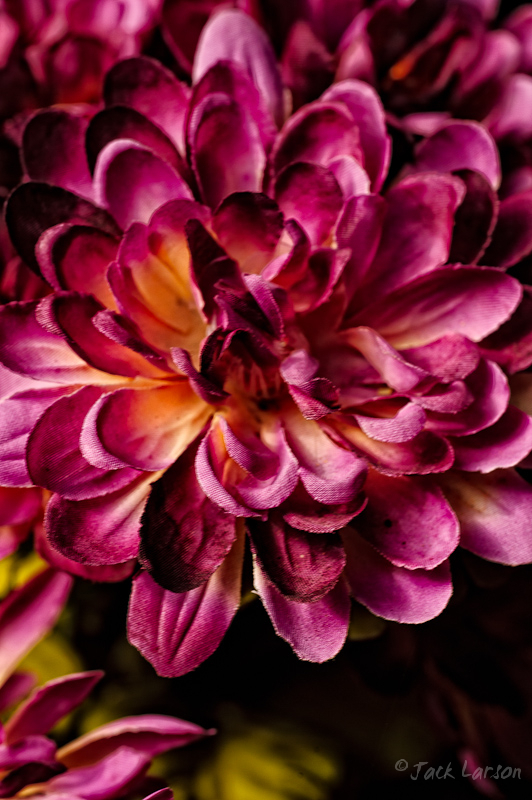 Beautiful colors, detail and symmetrical pattern captured in this flower! I love the textures and colors. Funny! Wonderful vibrant color and beautiful macro!